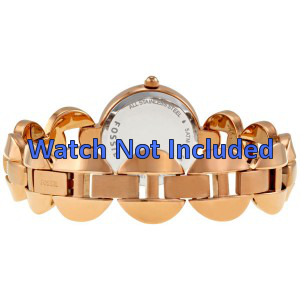 Fossil ES-3011 watch strap Steel Gold (Rosé) - Order now! Fossil ES-3011 watchband Steel Gold (Rosé) - This new watch strap from the brand Fossil, model ES-3011 is made of a strong steel / metal material and can be attached to your watch case by special pins. This new watch strap from the brand Fossil, model ES-3011 is made of a strong steel / metal material and can be attached to your watch case by special pins. This replacement watch strap fits only on the watch model ES-3011 from Fossil because of its specific shape. When in stock, this item will be shipped to your address the same day (when ordered before 4:00 PM GMT +1:00). If not in stock, please check the estimated delivery time. We provide 2 months guarantee on damage caused by manufacturer faults or errors. Please contact us if you have any question regarding this Fossil watchband or if you have other questions. Click on the 'Contact' button at the upper right corner of our website. Are you not sure if this watchband will fit on your watch? Contact us so that we can check this for you. So far so good haven't received our goods yet. Very good service but expensive for a strap keeper! Easy to deal with and very efficient but I think strap keepers are expensive. Heyho, no-one made me buy it! Good quality in your product and excellent costumer service, we had some problems with the delivery and it too long, but they always were very kind. I love my purchase.